We offer hands-on, educational programs for a wide variety of bookings! Click on the options below for more information! Give your students a chance to really connect with what they’re learning about by bringing an immersive, hands-on animal presentation to your classroom! 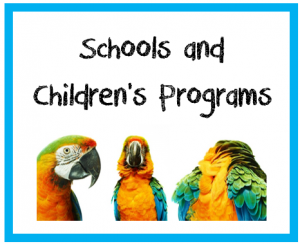 Our programs can discuss topics related to animal biology, conservation, and other curriculum based topics as requested. We have handlers with knowledge and experience to engage all ages include kindergarten all the way to university and more! Program Run Time: Bookings start at 1 hour. Time can be partitioned as you prefer (i.e. within one hour, split the time into two 30 min classes for younger students with shorter attention spans). Recommended Group Size: 20-30 participants/presentation to maximize interaction time. Larger groups are possible, but there will be less opportunity for interactions or fewer animals. Meet/greet format instead of a formal presentation for school fun fairs/mental health break activities, etc. Adding an extra handler to facilitate more interactions with larger group sizes. Travel surcharge for locations >25 km from our site. Handlers arrive 15 min early for set up. If you believe that your venue will necessitate longer load-in time (downtown venues, large buildings, etc. ), please discuss with us to add time to allow for load-in and load-out. A parking spot as close to where we are offloading as possible. An adult to watch over animal carriers for the few minutes when we are offloading to make sure no one is peeking or poking into carriers. Adult presence during the presentation to facilitate the children. Please remember that our job is to handle animals. It is not our place to be parents to the children as well. Besides, we love it when adults join in too! A quiet and controlled environment for the animals. If at any point the noise level becomes too loud or the participants are unable to follow our safety rules, our handlers reserve the right to stop the presentation. 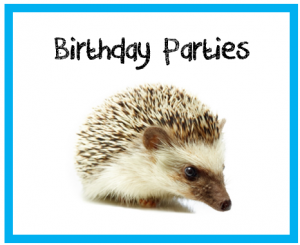 Our birthday parties provide the unforgettable opportunity to interact with exotic animals while at the same time learning about the animals’ biology, conservation issues, and responsible pet ownership. Our parties are not just for kids! We often attend parties and private experiences for adults and seniors as well. Have that camera ready; pictures are encouraged! Program Run Time: Minimum 1 hour, and additional time can be added. Recommended Group Size: 15 participants or fewer for maximum hands-on experience. Larger groups are possible, but there will be less opportunity for interactions. Requesting a shorter presentation and filling the time with more meet and greet and pictures. Smaller spaces are possible; our handlers are great at using whatever space they are given! Take a walk on the wild side by inviting a variety of exotic animals to your next event! 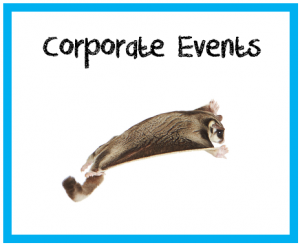 Bring this unique experience to your office for a great opportunity to laugh and have fun together while learning and having a greater appreciation for wildlife. Program Run Time: Minimum 1 hour, but additional time can be added. Meet/greet or fair format instead of a formal presentation. 10×10 ft space for our handler, supplies, and animal carriers with the participants sitting beyond that with enough room between to walk around and up close with the animals. Adult presence during the presentation to facilitate any children. Please remember that our job is to handle animals. It is not our place to be parents to the children as well.